The resolution would fund the government through December 15, but the Senate is certain to reject the attack on the Affordable Care Act. The resolution now goes to the Senate, where the Democrats who control the chamber will surely kill the Obamacare provision; if they don't, President Obama has promised to veto it. Then they'll send it back to the House, which will have to vote on whether or not they accept the funding resolution that reinstates money for the health-care law. If the two sides don't reach a deal by October 1, the government will shut down, and there appears to be little or no progress in negotiations. The Republican hope is that at the very least, the Senate vote forces vulnerable Democrats to take a stand on Obamacare. A post-vote House Republican press conference was mostly a litany of names of red-state Democratic senators up for reelection. But of course those Democrats have already voted for Obamacare once before, so there's little incentive for them to turn against it now. If all else fails, Republicans hope they can position themselves to profit politically from a shutdown. 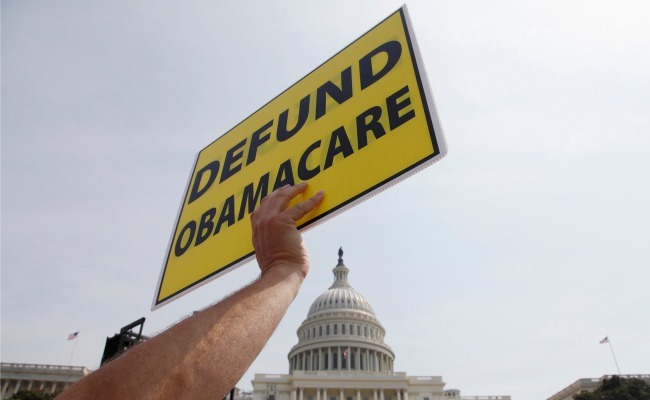 They reason that Obamacare is unpopular, and shutdown is unpopular, so they've passed a bill that solves both problems: It defunds Obamacare and funds the government. Yet as Molly Ball explained earlier this week, history and polling data both suggest that's a pipe dream. So where do things stand now? The country is still squarely on the road to a government shutdown, just like it was yesterday.